The Denver Business Journal ranked the fastest-growing private companies in the Denver area. In their special report, they take a look at the top three companies, including Armstrong Steel, in each of five size categories based on revenues. 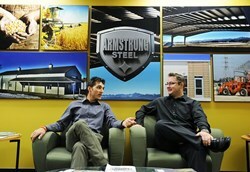 Eric Beavers, vice president of operations, and Charles Nelson, graphic designer, at Armstrong Steel. We’d resolved early on to disrupt and change the industry for the better, and the competition...didn’t like it one bit. We offered better prices, a superior product and top-notch customer support after the sale - and that was a real threat. For Ethan Chumley to build Armstrong Steel into the finely tuned, fast-growing company it is today, he first learned how not to do it. About 10 years ago, he answered a newspaper ad for a position as a building consultant at a Colorado firm that made pre-engineered metal buildings. “I was so intrigued by the products and services the company offered, I took the job,” Chumley said. But Chumley noticed a crack in the foundation when he began getting calls from clients saying the building they’d ordered hadn’t arrived and that their calls were going unreturned. Chumley started researching on the Internet and learned the company had several unresolved complaints with the Better Business Bureau. “I knew I couldn’t keep working there in good conscience,” he said. And all the while, Chumley couldn’t quit thinking about starting his own company – one that made service after the sale a standard operating procedure. In 2006, he took that attitude with him to launch Armstrong Steel. Chumley likens Armstrong’s early years to a David and Goliath story. Before things got better, they got worse. Today Chumley said Armstrong Steel is debt-free with clients around the globe and in every state. “For us, there’s only one path and it leads to greater sustainability, increased market share, growth and prosperity,” he said.